If you’re looking for a classic Valentine’s Day gift that isn’t chocolate, why not flowers? The traditional choice might be roses, but remember you’ve got a whole slew of colors and kinds! Find flowers that suit your sweetheart and have them delivered to their school or workplace, or give them to them personally. If your sweetheart has a green thumb, consider a potted plant instead. For a tasty treat that won’t rot their teeth, nuts make a great option. As a healthy snacking choice, your Valentine will particularly appreciate the gesture if they’re avoiding extra sugar this holiday in pursuit of a healthier diet. However, make certain they don’t have a nut allergy – this is not an ideal gift for a children’s classroom party. Check out these 4 Dentist-Approved Snacks if you’re feeding a group. Puzzles make a great gift – especially if you can devote the time to helping put it together. Find a puzzle with a picture they’ll love, then complete it together. Bonus points if you plan this gift early enough and get a personalized puzzle designed just for them! What’s relatively inexpensive, fun for everyone, and doesn’t rot your teeth? Stickers! Help your kids pick out stickers to take with them to school in lieu of candy this year. Looking for a more grown up version? Pepper their mirror, car, or anywhere you know they’ll be with sweet sticky note messages. Who says candy should have all the fun? Your favorite foods can be shaped into hearts so they fit the Valentine’s theme without the added sugar. Use a heart shaped cookie cutter to make Valentine’s eggs in a basket (an egg fried in the center of a piece of toast) or cook up a heart shaped pizza for dinner! 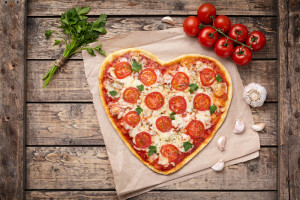 Some pizza places will even deliver a pre-made heart shaped pizza to you. If you and your sweetheart have a hard time making regular dates, this is the perfect gift for you. Plan out and prepare dates for the rest of the year. Make your ‘box’ personal for the two of you, and think about what time of the year each date will happen. Another great aspect of this gift means you and your date can order tickets ahead of time, or get reservations before they have a chance to fill up. If you want to include something sweet in your Valentine’s lunch box, you could always pack a serving of their favorite fruit. Include a little note alongside a bowl of strawberries or write a note directly on that apple with an edible marker. While there’s still sugar in fruit, it’s far less than traditional candies, and of course, fruits are loaded with fiber and vitamins. Perfect for the sweetheart who’s always giving. Help them take a break and relax with a little time at the spa. Find out if they’d prefer a massage, a mani/pedi, or a facial, then book it for them. Of course, if you want to surprise them with the visit, get a package that lets them select their own date later. An I.O.U. booklet is great for any Valentine! Create a list of things you could do for them, then make ‘coupon’ pages for each act of kindness. These booklets make a great gift from child to parent, for friends, or anyone who’s a little difficult to shop for. What’s a better present than your time? Another classic, and sometimes higher in price range, consider jewelry this Valentine’s Day. From pearls to plastic, there is a wide range of options and price points out there. If you’re shopping for him, don’t forget about watches and cufflinks! Have a ball this February! Whether you get your sweetheart a new baseball, or a pack of bouncy balls, you’re sure to have some fun and get in a little exercise. This is also a great present for your furry Valentine – pick up a frisbee or new ball for Fido and spend some time playing. Younger kids tend to be underwhelmed with the hearts and kisses that accompany February 14th. Instead, pick out a sporty new racecar for them to play with. Even better, grab a couple and create a track to race on. They might not appreciate the ‘icky’ love in the air, but they’ll sure love spending time with you! Is your Valentine a bookworm? Grab them something new from the bookstore. Learn about their favorite stories, authors, and genres before you go, to make sure you pick out a book they’ll love! Help them keep their teeth clean no matter what treats they pick up today! Sugar-free gum can help your loved ones protect their teeth by cleaning away harmful sugars. Since the gum itself is sugar-free, it’s a guilt-free way to add a little sweetness to their holiday. Find out more about the goodness of gum. Your special someone deserves a special day – but that doesn’t mean it must be candy-filled! Opt for our teeth-friendly treats and gifts above. If your teeth already need some love, give GPS Dental a call at (210) 633-3477 to schedule an appointment and get your smile back on track.